Under Pressure, Algeria's Leader Won't Seek 5th Term — But Delays Upcoming Election "I particularly understand the message given by youth, in terms of anxiety and ambition for their own future and that of the country," said 82-year-old President Abdelaziz Bouteflika. Algerian President Abdelaziz Bouteflika (right) says he won't seek re-election following weeks of mass demonstrations against his tenure. 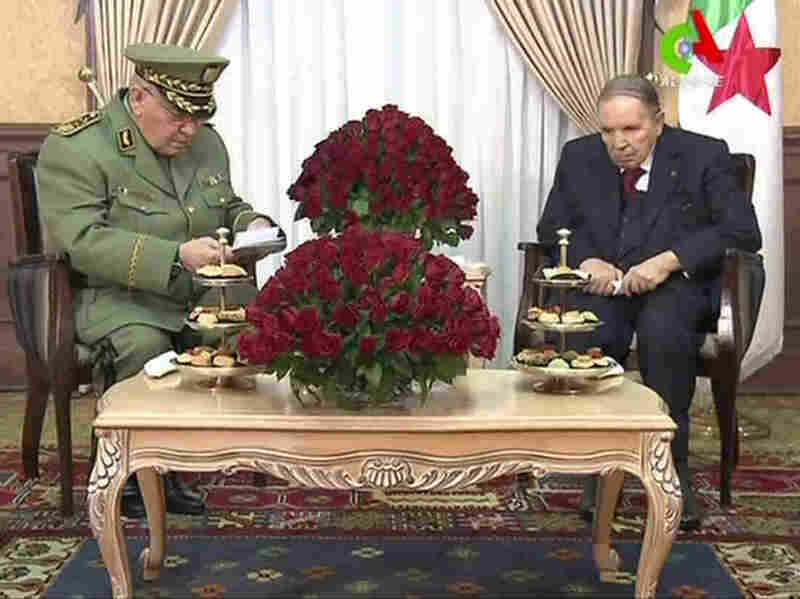 Bouteflika is shown here meeting with Algeria's army chief, Ahmed Gaid Salah, in Algiers, in a video grab from footage broadcast by Algeria's Canal Algérie network. Bowing to weeks of protests, Algerian President Abdelaziz Bouteflika has reversed his decision to run for a fifth term and says he will not seek re-election. But the 82-year-old leader stopped short of stepping down and has delayed elections set for next month. "I particularly understand the message given by youth, in terms of anxiety and ambition for their own future and that of the country," Bouteflika said in a message published by the Algeria Press Service. Bouteflika announced his decision a day after returning home from Switzerland, where he had been receiving medical care since late February. While he was away, widespread demonstrations railed against another term for Bouteflika. Bouteflika officially filed election papers earlier this month. At the time, he said that if he won, he would call for new elections within one year. But that didn't satisfy those rallying against him. "The protests that changed his mind have shattered years of political inertia and unsettled Algeria's opaque but powerful security establishment," NPR's Eleanor Beardsley reports from Paris. "There have also been demonstrations against Bouteflika in cities across France, home to the world's largest Algerian diaspora." A student holds a banner during a protest against Algerian President Abdelaziz Bouteflika in Algiers on Tuesday. 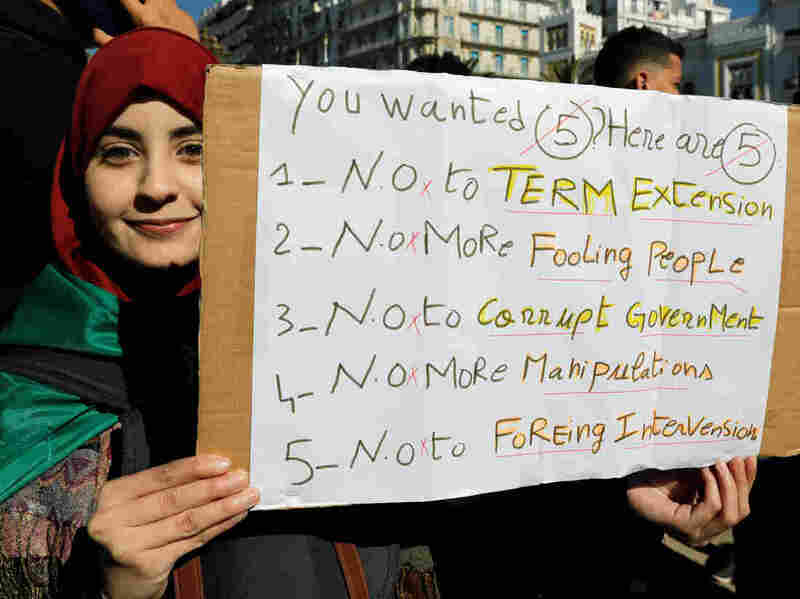 Demonstrators immediately celebrated Bouteflika's reversal, even as they repeated calls for him to leave office immediately. Algeria's election had been slated for April 18; Bouteflika said the vote will be delayed to ease apprehensions and "pave the way for spreading serenity, tranquility and public security." The change was announced days before Algeria's Constitutional Council was due to certify the legitimacy of candidates running for the presidency. Bouteflika's critics question whether it is legal to unilaterally declare the postponement of national elections would be postponed — and they're now left to wonder what will happen when the president's current term expires on April 28. "Algerians are skeptical, they're waiting to digest this information," France 24 journalist Meriem Amellal said, as questions about the status quo lingered Tuesday. Bouteflika suffered a stroke in 2013. Since then, he essentially has been absent from the public eye, often represented at government events only by a framed portrait. His critics say it's an apt symbol of the current state of his presidency — accusing members of his party and the military of using Bouteflika as a figurehead to maintain power as Algeria's economy stagnates. Despite the unrest, Bouteflika was still widely favored to win a new term — in large part because his party, the National Liberation Front, has dominated Algeria's politics since it gained independence from France in 1962. French President Emmanuel Macron hailed the latest development on Tuesday. "The Algerian youth has expressed their hope for change with dignity," Macron said in a tweet. "The decision of President Bouteflika opens a new page for Algerian democracy." La jeunesse algérienne a su exprimer son espoir de changement avec dignité. La décision du Président Bouteflika ouvre une nouvelle page pour la démocratie algérienne. Nous serons aux côtés des Algériens dans cette période nouvelle, avec amitié et avec respect. In Algeria, the string of mass protests has stoked memories of the country's civil war. As NPR's Shannon Van Sant has reported: "In 1991, a multiparty election in Algeria sparked a decade-long, violent civil war, which killed more than 200,000 people. The war ended in a return to authoritarianism, and memories of the conflict have helped Bouteflika and his party stay in power."